Le Fashion Truck: Start A Fashion Truck Business... We'll Show You How! 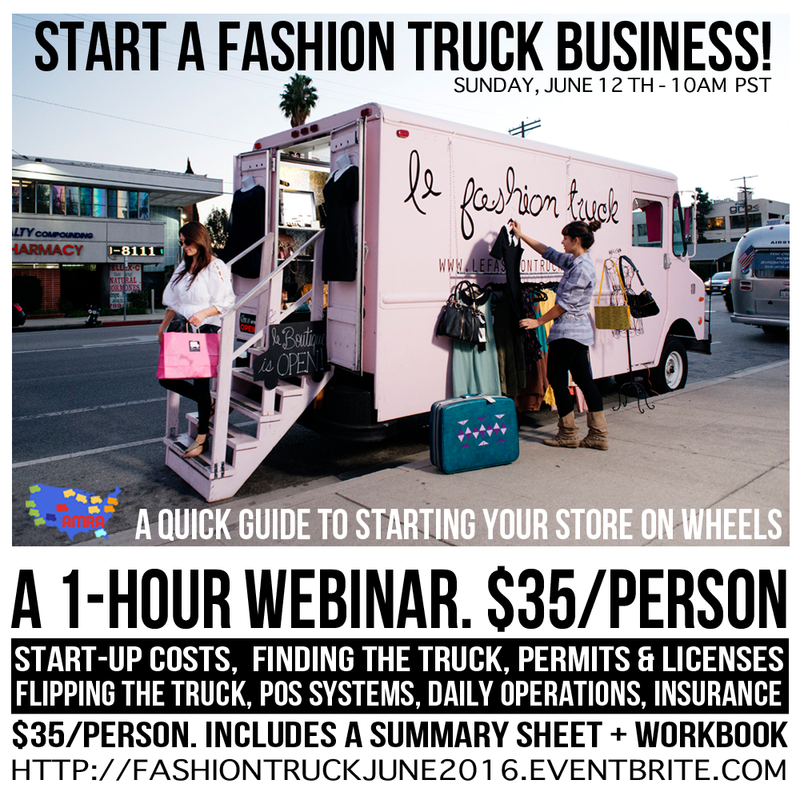 Start A Fashion Truck Business... We'll Show You How! Are you planning to start a fashion truck business or a mobile retail business and need help getting started? 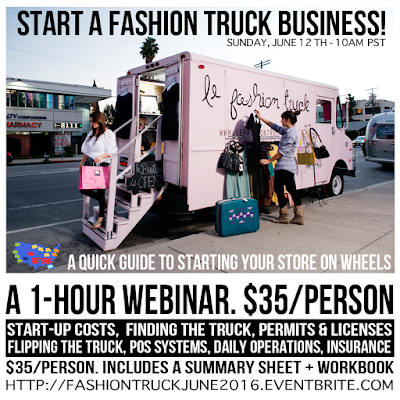 Take our June webinar, the NEW "Start a Fashion Truck Business" webinar! "Start a Fashion Truck Business"
Learn how to start your own store on wheels! A cliff notes version of the American Mobile Retail Association's small business educational series, our live fashion truck startup webinar is hosted by the founders of the country's first permanent store on wheels - Le Fashion Truck! Co-owners Stacey Jischke-Steffe and Jeanine Romo have been in business for 5 1/2 years with their Los Angeles-based fashion truck and knows what it takes to get started on a limited budget and with a focus on do-it-yourself practices. Our original startup webinar, "How to Launch a Mobile Retail Business" has been revised to offer a faster, more affordable alternative for aspiring truckpreneurs. Gain all the necessary tools, tips and tricks to starting your own store on wheels! Learn about writing a business plan, researching licenses and permits, registering your business, startup costs, monthly budget, finding the truck, converting the interior, POS systems, inventory control, day-to-day operations, and helpful tips! Includes an extensive summary guide and worksheet to guide you along your journey! Click HERE to sign up! Note: this service is currently offered as a live webinar only.